Prof. Wahlster has been working since 1975 in the field as a principal investigator in more than 60 projects on intelligent user interfaces. He was the Scientific Director of the VERBMOBIL consortium on spontaneous speech translation (1993-2000), the SmartKom consortium on multimodal dialog systems (1999-2003), the SmartWeb consortium on mobile multimodal access to semantic web services (2004-2008), the SemProM consortium on semantic product memories (2008-2011) as well as the RES-COM consortium on resource efficency by context activated M2M communication (2011-2014) and served as the Scientific Director of the SmartF-IT consortium on cyber-physical IT systems for mastering the complexity of multi-adaptive smart factories (2013-2016). Dr. Wahlster is a principal investigator in the Cluster of Excellence “Multimodal Computing and Interaction” and the International Post-Graduate College in Language Technology and Cognitive Systems with the University of Edinburgh (School of Informatics), both funded by the German Research Foundation. Professor Wahlster is a member of the Supervisory or Scientific Advisory Boards of various ICT companies including Deutsche Telekom Laboratories, SAP Research, AGT Germany, and Sensitec. Since 2009 he serves on the Governance Board of the Intel Visual Computing Institute. Since 2012, he is the Chairman of the high-level expert Advisory Board for the Future Internet Public-Private-Partnership Programme (FI-PPP) of the European Commission. Prof. Wahlster was the Conference Chair for IJCAI-93 in Chambery, the Chair of the Board of Trustees of IJCAII from 1991-1993, a Trustee of IJCAII from 1989-1999, the ECAI-96 Programme Chair and the Programme Co-Chair of ACL/EACL-97. He has served as the Chair of ECCAI, the European Coordinating Committee for Artificial Intelligence, from 1996-2000. In 2000, he was the President of the Association for Computational Linguistics (ACL). He has been and is serving on a number of international advisory boards, including the Board of Trustees and the Executive Committee of the International Computer Science Institute (ICSI Berkeley, USA), the iCORE Research Advisory Committee (IRAC, Calgary, Canada), the Alberta Ingenuity Centre for Machine Learning (AICML, Edmonton, Canada), the Information Society Technologies Advisory Board (ISTAG) of the European Commission (Brussels, Belgium), the French National Institute for Research in Computer Science and Control (INRIA, Paris, France), the Japanese Information Technology Research Institute (ITRI, Tokyo, Japan), the Steering Committee of the German-Japanese Forum on Information Technology, the Scientific Advisory Committee of the Swedish Information Technology Institute (SITI, Stockholm, Sweden), the International Advisory Board of the Nijmegen Institute for Cognition and Information (NICI, Nijmegen, the Netherlands), the Scientific Council of IRST (Trento, Italy), the THCU Advisory Board at the Caesarea Rothschild Institute (Haifa, Israel), the Advisory Board of the Fraunhofer Institute for Industrial Mathematics (ITWM, Kaiserslautern, Germany), the Scientific Advisory Committee of the OFFIS Institute (Chair, Oldenburg, Germany), the International Research Forum of SAP (Darmstadt, Germany), the Advisory Board of Deutsche Telekom Laboratories (Berlin, Germany), the Management Board of the Deutsche Telekom Laboratories at Ben-Gurion University of the Negev (T-Labs@BGU, Beer Sheva, Israel), the Advisory Board of the National Institute of Informatics (NII, Tokyo, Japan), the Scientific Advisory Board of the Singapore Institute of Manufacturing Technology (SIMTech, Singapore) and the Center for Advanced Security Research (CASED, Darmstadt, Germany). Since 2009 he is a member of the Executive Steering Board of the EIT ICT Labs of the European Institute of Innovation and Technology (EIT) with its German Co-Location Centre in Berlin. Since 2008 he serves as a member of the University Council of the University of Hamburg. Professor Wahlster has received numerous honors and awards for his research contributions. He is an AAAI Fellow (elected in 1993), an ECCAI Fellow (since 1999), and a GI Fellow (since 2004). In 1991, he received the Fritz Winter Award, and in 1995, an IST Prize (European Information Society Technologies Prize) for his research on cooperative user interfaces. In 1998, he has been awarded the degree of Doctor Honoris Causa by the Institute of Technology at Linkoeping University, Sweden. In 2001, he received a second Honorary Doctorate from Darmstadt University of Technology in Germany and in 2015 a third degree of Doctor Honoris Causa by the Maastricht University in the Netherlands. In 2000, he was the first AI researcher to receive the Beckurts Award, one of Germany’s most prestigious awards for scientific and technological innovations. In 2001, the President of the Federal Republic of Germany, Dr. Johannes Rau, presented the German Future Prize to Professor Wahlster for his work on language technology and intelligent user interfaces. 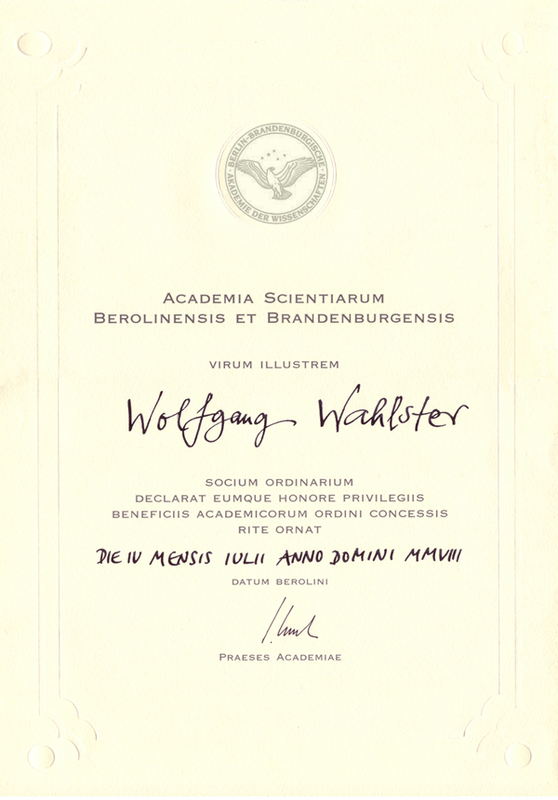 He was the first computer scientist to receive Germany’s highest scientific prize that is awarded each year for outstanding innovations in technology, engineering, or the natural sciences. Since 2001 he serves as the scientific spokesman of the Feldafing Circle, an association for promoting joint internet research by academic and industrial partners in Germany. In 2004 he was elected to the Münchner Kreis, a supra-national association dedicated to communications research. In 2004, he was appointed Saarland Ambassador and in 2005 he became the spokesman of the Saarland Ambassadors. In 2005, he has been appointed Chairman of the prize committee for the HERMES Award, one of the most valuable technology prizes worldwide. In 2012, Professor Wahlster has received the Eagle of Saint Venceslao, the highest recognition given by the Autonomous Province of Trento, Italy. He was recognized for his research on intelligent user interfaces and more than 15 years of scientific consulting services to the IRST research institute in Trento. In 2013, Professor Wahlster received the Donald E. Walker Distinguished Service Award of the International Joint Conferences on Artificial Intelligence for his substantial contributions, as well as his extensive service to the field of Artificial Intelligence throughout his career. In 2016 he was honored for his innovative, long-lasting, and influential contributions to defining the field of multimodal/multimedia interaction, interfaces, and system development with the ICMI Sustained Accomplishmend Award of the Association for Computing Machinery (ACM). In 2017 he has been awarded with the Saarland Order of Merit by the Prime Minister of the Saarland.